St Elidyr's was originally part of the possessions of Pembroke Priory. The church was later granted by the Crown to the Abbey of St Albans, but was in Crown possession again by 1594. The names of Rectors are recorded from the year 1344. Any original village in the vicinity of the church has completely disappeared. £50 was spent on an attempt to repair the church in 1814. The church was felt to be too low and it was probably at this time that the floor was excavated to beneath ground level to increase the apparent height, resulting in problems of cold, damp and decay. The Rev. W D Phillips was inducted in 1839 and the next year he resolved to rebuild all except the tower and parts of the walls, at an estimate of £230. The ICBS granted £35 in 1846 and subsequently £10 more. The work cost £241; there is no mention of any architect's fee, but the name Thomas Jones appears in the application. The accompanying plan is inaccurate. The church was re-opened in late 1847. Glynne, visiting in 1869, remarked that the church was entered by the W end through the tower. He considered that mediaeval masonry had been retained in the N side. He remarked on a pointed arch in the N wall of the chancel and that the windows were of two lights with no tracery. The church was again restored in 1878 by T David of Laugharne. The original S door was re-opened, so the porch was then added. The pews were changed to bench seats and four additional windows were inserted. The vestry was probably added at this time. Wrought-iron double gates with a cobbled path lead to the porch. There is a stile in the wall adjacent to the gate. 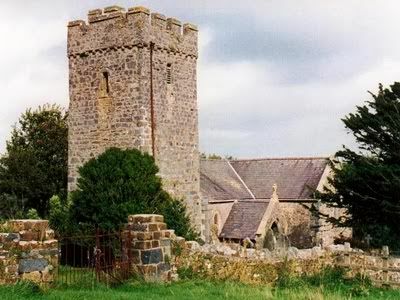 The ruin of a small stone building stands at the NW of the church, and there is a well in the field to the N.
A tower of moderate height and local type with its stairs turret at the NE corner, with a nave of low height, chancel, N and S transepts, and later S porch and N vestry. Tower and much of the fabric of the church are medieval though of uncertain date. The parts added or greatly restored in the C19 are in a sandstone rubble masonry, with rusticated limestone quoins on the S side of the church only. Slate roofs with coped gables. A cross-finial over the porch only. Lancet windows, singly or in plate form, with no embellishment. A slate monument on the E wall of the S transept to John Howell, d. 1727: a non-juring minister ejected from his living at New Radnor in 1691. The pointed open arch of the porch has a curiously rustic decoration of flowerhead motifs impressed in render. The tower is of local sandstone of varied type in large courses. The tower and its stairs turrets both have crenellated parapets on corbels. Slit lights to the stairs. String course at a low level. Single bell-chamber openings with louvres on each face. A short chancel about 4 m by 6 m, a nave about 12 m by 7 m, with vestry, transepts and porch. There is one step up at the chancel arch and one at the sanctuary. The chancel ceiling is of timber boarding in vault form. The altar has a low wide reredos, returning a short distance at N and S, installed in 1934. E window with three lights and three roundels with stained glass in poor condition. Two plain windows in the S wall. Chancel arch with a single chamfer, in which a modern rood has been installed. There are similar arches to the transepts. The nave roof is of low pitch on collar-beam trusses, with intersecting trusses at the crossing. The remainder of the nave roof is of three bays and each transept roof is of two bays. Octagonal pulpit at the S side. Post-war stained glass in two nave windows, including a representation of Broomylake farm. The tower base has a stone floor and a stone-vaulted ceiling. Listed as a small rural church retaining significant mediaeval elements including the tower. ½ km N of Llanteg. The house is on a corner site with roads to E and S. Roadside hedges, modern gate between stone piers.